Like all other Asian food establishments, it’s nearly impossible for me to eat at a Japanese restaurant, what with all that sesame and soy, but I’ve actually had Sushi before. Back when I was living in Boston I had one of those tiny little original Whole Foods (I think it may have been the first on the East Coast) right near my apartment and I frequented it often. I got to know one on the Sushi chefs there and he started making me Alli-allergy-approved salmon rolls. He rolled cooked salmon (I’ve tried raw fish several times and it’s not my thing), cucumbers and carrots in a layer of nori and rice on a clean work surface free of sesame seeds. I skipped the non-Alli-allergy-friendly soy sauce and enjoyed a bit of wasabi and pickled ginger, which I could eat a bucket full of, as accompaniments. And so the inner monologue went until a few weeks ago when I stumbled on a recipe for mock soy sauce that people claimed tasted like the real thing and I reeeally reeeally wanted to make Sushi! Still the logistical problems remained so I did what anyone would do in 2012, I took to Wikipedia and looked up the various types of Sushi. My best bet seemed Oshizushi or box sushi, a specialty in Osaka where the ingredients are placed on the bottom of a box, rice is placed on top and then the whole thing is pressed together firmly, unmolded, cut in to squares and served. Oshizushi Seemed like the best bet, but where to get the box? 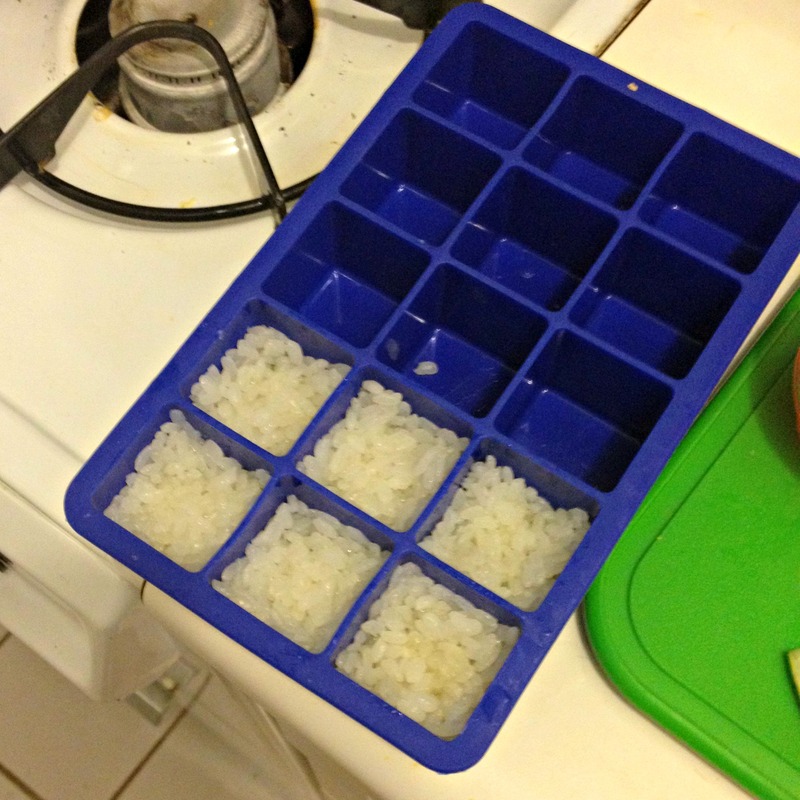 Then it occurred to me; ice cube tray sushi. Using an ice cube tray to make sushi was something I’d heard about awhile ago and filed somewhere in the back of my mind (a scary, messy, disorganized space; I assure you!). I’d seen the idea in several places touted as a way to get kids to try Sushi* and I just adored it (kids in the kitchen yeah! ), but I realized there was no reason I couldn’t use an ice cube tray too. Ok, ok so it’s not really authentic, but I’ve been really good up until now so cut me a little slack! I had a hard time deciding on toppings because I wanted to at least keep that part authentic, but sushi has become so ubiqutes these days that it’s hard to tell what’s authentically Japanese and what’s not at this point so I kept it simple. 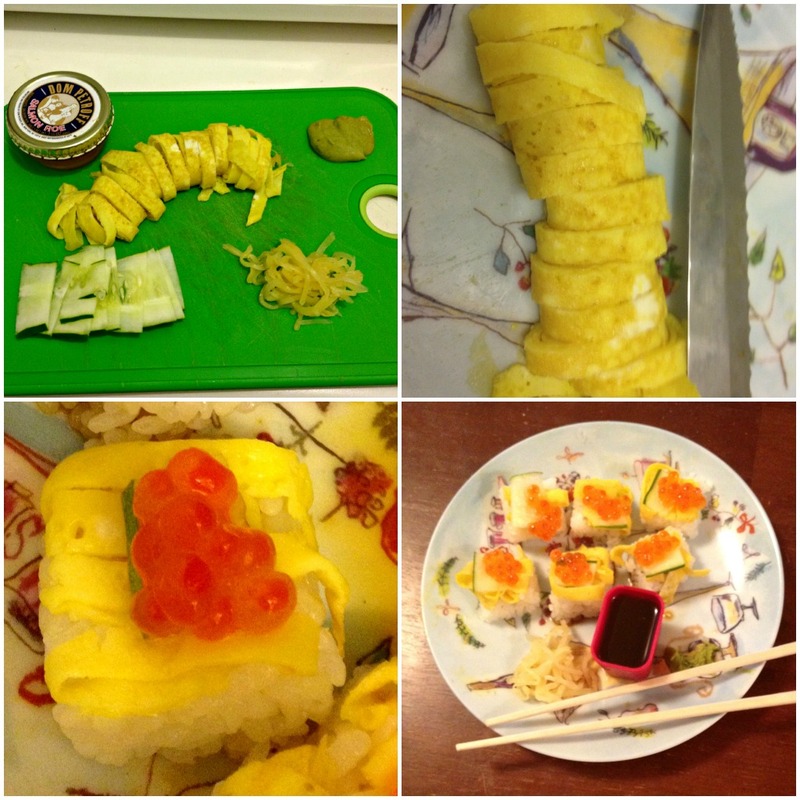 I decided on thinly sliced cucumber, thin Japanese omelette and salmon roe. The roe was a bit of a splurge, but once in a while you just have to! I’m sorry that there’s not really a recipe with this, but it’s really more of a technique then a recipe. I will so so soooo be making this again with a variety of different ingredients, authentic and otherwise. The only change I’d make is that I think I’ll just mold the rice in the trays and then stack everything else on top. Some of the toppings slipped off a bit after unmolding and I realized it’s really only necessary to mold the rice. PS- *For anyone saying, “Kids won’t eat Sushi, they only eat chicken fingers,” go visit my friend Erin’s blog and ask her what her beautiful daughter eats! 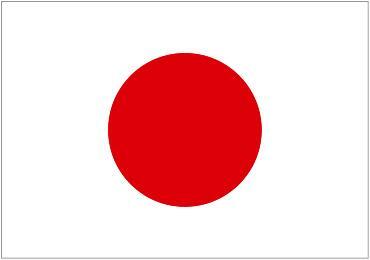 Erin- I fully expect Katherine to be eating ice cube tray Sushi some time in the next few years. 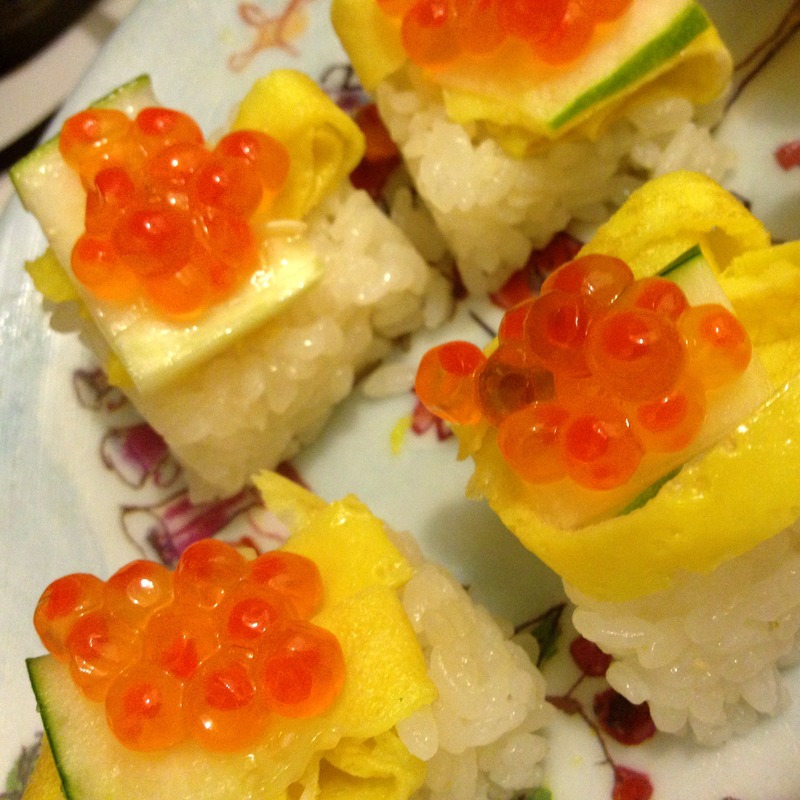 This entry was posted in Uncategorized and tagged Fish, Japan, Recipes, Vegetarian.